Game-blame news from Romania: a 15-year-old boy said to be "dependent" on video games stabbed to death his adoptive mother, after she refused to pay the Internet bill in hopes the disconnection would put an end to his Counter-Strike addiction. 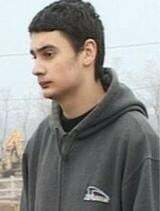 In the narrative of the attack the boy, Ionut Savin (pictured), stabbed his mother (on her 16th wedding anniversary, no less), then looted the home of its money and went to an Internet cafe to get his Counter-Strike fix. The woman's lifeless body was found by her husband, and Savin turned himself in to authorities quickly thereafter. He's now under armed guard at a psychiatric hospital. This naturally has mobilized the Romanian media, because there's nothing worse than a kid with 200 absences from school and no friends snapping in such an unpredictable way. It doesn't justify a murder, but by their own reporting, the warning signs were plenty.